A few nights ago I was collecting our mail from the local post office at about 10:30pm (don’t ask why I was getting the mail so late at night – it’s another story). 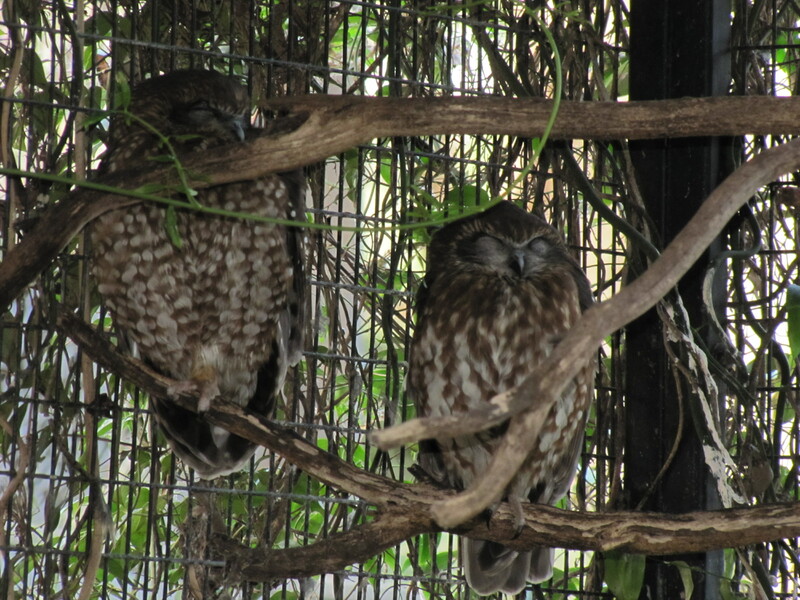 As I emerged from the car I was delighted to hear the distinctive call of a Boobook Owl nearby. The sound was probably coming from the trees near back of the Town Hall, or perhaps the nearby railway station. I didn’t have a torch with to track it down, nor did I have a camera with me, so I’ve used the photo of one I took in our garden a few months ago. I guess I was a little surprised at first to hear an owl right there a few steps from the town’s CBD. When I thought about it the owl was probably resident in that area for a very good reason: food. Around the various shops and businesses and several schools within 500 metres, the pickings would have been good. Rats and mice abound in the area so it would probably not be going hungry. About ten years ago some students in the school in which I was teaching noticed one in the tree at the front of the school and pointed it out to me. Nice to know it’s surviving in this location. The Tawny Frogmouth has a special place in our family folklore. Back in the mid 1980s we were camped in the Hattah-Kulkyne National Park in north west Victoria. We were right next to Lake Hattah, a lovely camping spot and place full of interesting birds. On this occasion we were disturbed around midnight by an “um-um-um-um” sound in the distance – or so we thought. Imaging the worst we feared someone had a portable generator, something forbidden in most Australian national parks. It really annoyed us. Just as we were retiring the following night we heard the noise again. My attention was drawn to a dark shape in the tree just above our tent. Sitting there quite at home was our “generator”, a Tawny Frogmouth calling. This was the first time I’d heard this bird calling. And it kept on calling for a long time but we slept soundly, now knowing where the noise was coming from. We occasionally have this species in our garden which is great. We don’t often hear it calling due to other noises – such as the television. My latest encounter with the species was at the Visitor Centre of the Innes National Park. We were paying our entry fees and I saw the lovely bird (shown above) sitting on display on the counter. A beautiful bird. Sad to think that its um-um-umming days are over. It is not easy to get good photos of nocturnal birds like the Tawny Frogmouth shown above. I have had some unusual opportunities to get good shots of the Southern Boobook Owl, Spotted Nightjar and the Australian Owlet Nightjar in the past, but generally it is more a matter of taking unique opportunities when they present themselves. The Tawny Frogmouth is certainly one of my favourite birds. We first encountered this fascinating bird while camping at Hattah Lakes in Victoria many years ago. The bird on that occasion was perched on a branch above our tent calling persistently and annoyingly – until we found out what it was in our torchlight. Once we knew what it was we were able to relax and get some sleep. Its “oom-oom-oom-oom” call has an unusual quality; it seems to be coming from far off but can be only metres away. Tawny Frogmouths are found throughout Australia in a wide range of habitats. While they are most often heard at night it is possible to see them during the day. If other birds become aware of them roosting in a tree they can draw attention to the bird by mobbing it. I’ve expereinced this a number of times in recent years. While I can’t say this is a resident species in our garden, it is probably a more frequent visitor than we realise. It is certainly present in our district and we are only aware of one when we hear it calling at night. The above photo is the best I have of this species but it is not brilliant. 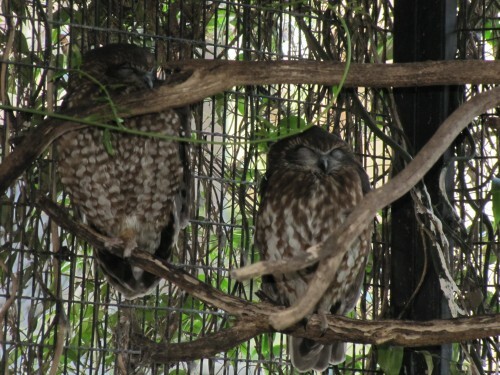 It was taken through the wire of an aviary at Adelaide Zoo. I hope that 2011 brings you many interesting and wonderful birding experiences. I am certainly looking forward to getting out birding a lot more in 2011 than I did over the last few years. Now that I’ve completed the requirements for my Master of Arts Creative Writing degree I am determined to get back to more birding. It has been an intensive time of study, writing, staring at the computer monitor and generally late nights. This New Year has so much promise and so many possibilities. I hope to continue to share my interest in Australian birds here on this site and to encourage my growing readership to participate through the comments section of each article. This year might see a completely new venture on this site. Our daughter is planning on spending half the year teaching overseas. My wife and I are hoping to visit her few a while and I will be taking plenty of photos of birds to share here on this site. We haven’t planned our itinerary yet but let me assure you that we are planning on visiting some very exciting birding parts of Africa. More news on this in coming articles. The New Year is nearly 12 hours old as I write this, but I still haven’t been out birding. After our celebrations I needed to sleep in a little. Just after midnight I heard a solitary Galah flying over our house. What it was doing flying around in the dark I don’t know; perhaps it was on its way home from New Year’s Eve celebrations! I thought I also heard an Australian Owlet-nightjar calling but it didn’t call a second time so I’m not sure about that one. Then at first light there was a Little Raven calling raucously outside our bedroom window. So much for trying to sleep in!